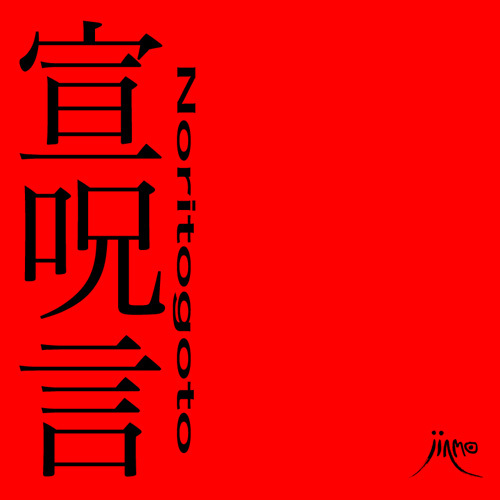 As shown on the album cover, "Noritogoto" means prayer in Japanese and it is the word derivation of "Norito" the Shinto praying in Japanese religion Shinto. Although it is very old word which is used in Shinto sect, it sounds rite of various tribes in more universal primitive animism. It is the words at prayer. It is not pre-determined phrases, it is the fluid words of tongues, Glossolalia. it is the prayer for the ceremony in Eros and Thanatos. Nestling in perfect unison of biotic guitar sound throughout the ceremony, a few women pray at the center of the circle surrounded by the men emitting rhythms in tongues such as Kecak rhythm. However all of these sounds are non-existence in reality. Neither Human voice nor guitar sound has not recorded in this album. JINMO composed this album without capturing various human chants or sound of the guitar. True to the images in his brain, JINMO had depicted this prayer with waveforms. Because the stately complex orchestration , the choir, string orchestration or pipe organ, every sound you've heared in "Eternal Moonbeam On Elysium", were played with only one guitar as "unaccompanied guitar solo". And it is also opposite to the longest album/track "Eternal Moonbeam On Elysium" that whereas three hours, this album "Noritogoto" is 30 minutes the shortest album in his career. Enjoy the prayer "Noritogoto", it would remain on your mind so long. The more you listen, the more new prayers.